If you are in sales, marketing or recruitment field, then most of the times, you have to send a single email to multiple recipients. In this blog, we have covered two methods that give you a quick step-by-step direction on how to send email to multiple recipients. The BCC method is an easier method but not particularly an efficient one. There are certain flaws and problems to it which are further solved in the mail merge method. For instance, sending an email to multiple recipients using the BCC method make the mass emailing behaviour evident to the recipient as the “To” field and the body of the email is not personalized making the sender look unprofessional. But none the less let’s start with the BCC method. The BCC (Blind Carbon Copy) method is the most common approach to send email to multiple recipients at the same time. Emailing to multiple recipients using the BCC feature hides other recipients from the recipient making it look like he is the sole recipient of the email. The only plus point of the method is that it is easy to understand and simple to operate. Without further ado, let’s show you how to send email to multiple recipients in Gmail using its BCC feature. Step 1: Open your Gmail account. Step 2: Click on the Compose box to type the email you would like to send to multiple recipients from your Gmail address. Step 3: After writing the email, click on the BCC option besides the CC option. Step 4: Once you select the BCC option, type in the email addresses of the people you want to email or you can select one of the Gmail groups. 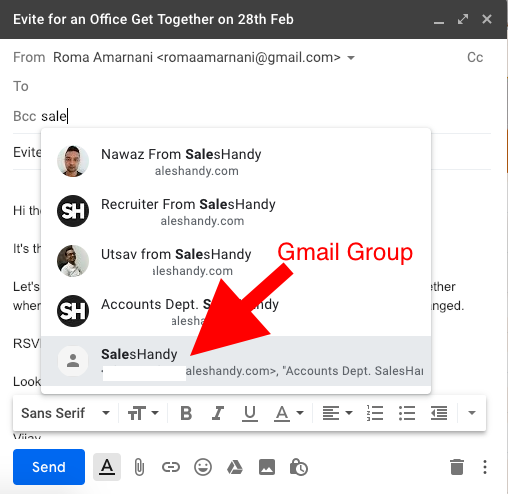 Don’t know how to create contact groups in Gmail? Learn how to create Gmail groups in just 2 steps. Step 5: Keep at least one person in the “To” field and then just hit send! As we mentioned in the introduction part, this is not the most efficient way to send email to multiple recipients in Gmail with this method. So, let’s talk about the limitations of using BCC (Blind Carbon Copy) in Gmail to send multiple recipients. Pro Tip: It is advisable not to use this method if you have over 10 recipients. The recipients in the BCC will see that they were added to the BCC field which makes it unprofessional. This BCC feature is workable only for informal emails. If any of the recipients reverted to your email and instead of selecting “Reply”, he selected “Reply to all” then all the recipients get his reply. One of the major limitations of BCC feature is the lack of personalization. The BCC method is a big no-go for sending out pitches and marketing emails. Why personalization is a must when pitching your future prospect? Find out here! Adding too many recipients in the BCC field can alert Gmail of spam activity and your Gmail account might end up blocked. Using CC instead of BCC is another limitation of the BCC method. When in a hurry, we overlook the smallest of details ending up costing us much bigger things? CC being in such proximity of BCC that anybody can easily make this mistake. Adding multiple recipients in the CC field loses the purpose of sending email to multiple recipients altogether. All the limitations of BCC feature are covered in the next method of sending an email to multiple recipients in Gmail. We have also added a section where we have demonstrated How to send email to multiple recipients in Outlook. But first, let’s show you the best way to send an email to as many recipients as you want from Gmail. The second and more effective method of sending an email to multiple recipients is to use email automation tools available in the market. In this blog, we are using SalesHandy as the email automation tool to create a mail merge campaign. SalesHandy offers a wide range of features including real-time email tracking, smart document tracking, mail merge with automated follow up, and email scheduler. Their mail merge feature comes with an automated follow-up feature which enables the users to set up to 9 follow-up stages for their email campaign. 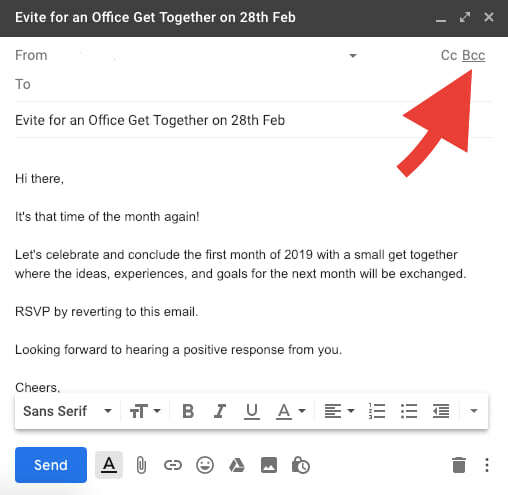 And without further elaborating the features, let’s show you how to send email to multiple recipients from Gmail using mail merge feature. Step 1: Sign up with SalesHandy and create an account with them using your Gmail account. You can sign up for FREE here. Step 2: Once you have signed up for SalesHandy, go back to your Gmail tab and confirm your email address. Step 3: Download SalesHandy extension. (Extension will power-up your day-to-day email activities.) Once you have downloaded the extension, refresh your Gmail tab to start tracking your emails. Step 4: After you confirm your email address, you will be redirected to their desktop app dashboard. Click on “Email Campaign” option here. Give a name to your campaign. This title won’t be visible to your recipients. It is only for your reference. Create a CSV and upload CSV in the “Add Recipients” section. Don’t know what is CSV and how to create the same? Refer our detailed guide here. You can also verify and clean the email list to ensure a lower bounce rate using SalesHandy itself. After choosing the account, it is time to set up the crucial part of the campaign i.e. subject line, email body with mail merge tags for personalization and follow-up emails. You can set up the follow-up stages according to the recipient’s behavior. Refer to How to Send Email Campaigns: A Detailed Step by Step Guide to learn the professional way of setting up a campaign. After writing the perfect email and setting up the campaign in SalesHandy app, it is time to send a quick test email to make sure how it looks and to check for any corrections. 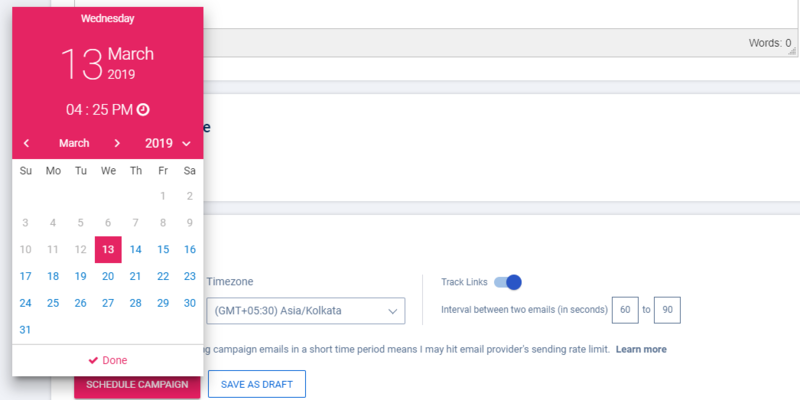 There are different options to consider like track links (tracks the links in the email), the interval between two consecutive emails (human-like sending), time zones (take the time zones of your recipients in consideration and schedule accordingly) and CC or BCC (You can CC your manager or BCC which is an indirect CRM integration) when scheduling the campaign. Your first email campaign is on us. Try it for free! Once you are through with all the steps, you will have successfully finished creating a marketing campaign to reach out to your potential prospects. Now, you just have to hit the send button. We are done with the “How to” part, let’s move ahead to learn how the mail merge feature helps overcome the flaws of the BCC method. Personalized Emails: With the mail merge feature, you can customize a single email for multiple recipients using mail merge fields and give that personal touch to your emails. Such emails will definitely make a lasting impression on your recipients. Automated Follow-ups: When you are emailing a pitch, I am sure that is not the only email you send. 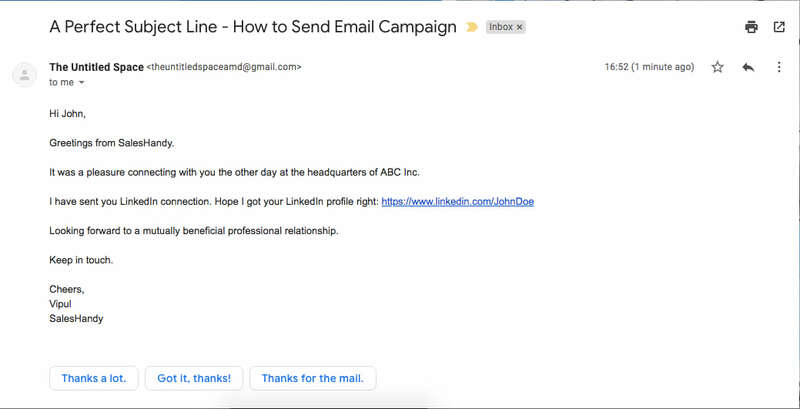 There are always follow-up emails and this advance feature takes that task off of your hands. Being consistent has always closed more deals. Follow-up emails also increase the reply rate of your campaign. Tracking and Analysis: The email automation tool comes with the greatest of advantage and that is tracking and analyzing the performance of your campaigns. You will be notified as soon as any of the recipients opens or replies to your email. This enables you to approach them when you have caught their attention. Privacy: This tool covers the loopholes of the BCC feature. It protects the information of the multiple recipients and sends your message across strongly. 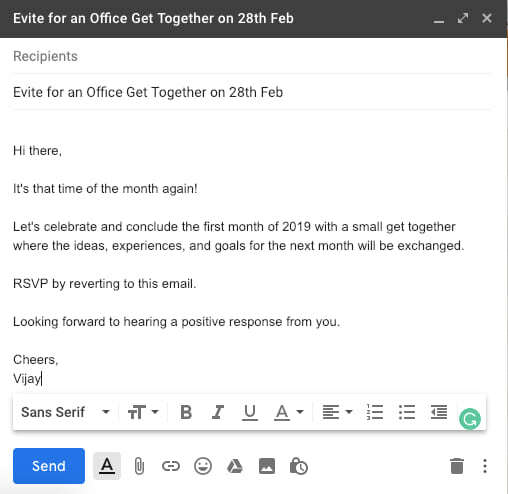 We have covered almost everything about how to send email to multiple recipients from Gmail but we know that the same question about Outlook is just around the corner.So, here’s a detailed blog for you to refer to on how to use mail merge feature to send email to multiple recipients from your Outlook account. When working in the customer-oriented business, little things create a huge difference. Personalization is one such thing. It makes sure that your recipients have a positive feeling when your email lends on their primary inbox. It might look like a small change but leaves a big impact on the mind of your clients. 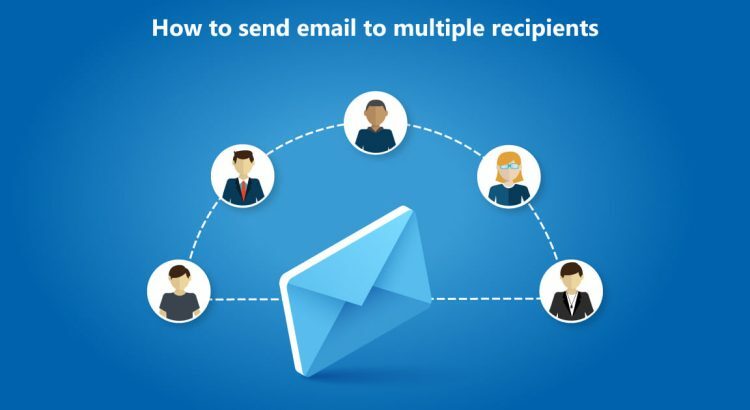 Hence, adapt the smarter way of sending email to multiple recipients. In case you have any doubts or suggestions, comment down below.